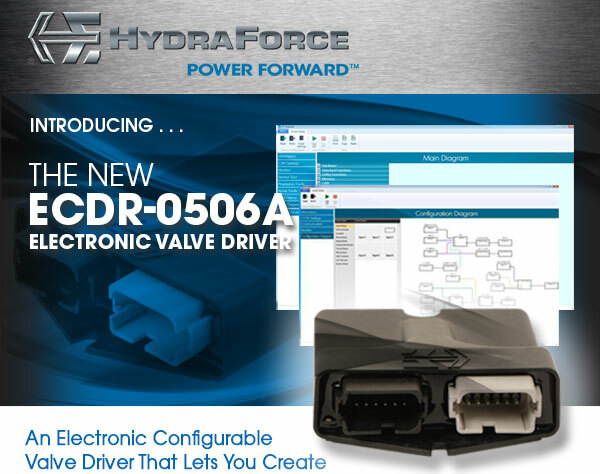 HydraForce has expanded its range of electrohydraulic controls with the addition of the configurable ECDR-0506A electronic valve driver. It can be used to enhance the control of hydraulic proportional valves used for transmission control, vehicle traction control, joystick control, and mobile equipment work functions, such as lifting, lowering, and rotating. This compact driver can be configured for your unique application without coding knowledge. The ECDR-0506A has a 32-bit processor and six inputs capable of various signal types; four analog and two digital. It has five outputs, four are closed loop and one is open loop. Its 8-32 Vdc voltage rating allows it to handle a range from battery to full voltage. It is also CAN-capable, with a CAN 2.0B communication interface capable of reading CANopen and SAE J1939 communication protocols. A bi-color LED, red and green, provides a quick status check for troubleshooting. The valve driver is fully configurable using HF-Impulse configuration software, developed specifically for proportional valve control by HydraForce. Designed for use in extreme environments, the ECDR-0506A driver has a robust, compact, and fully sealed housing that provides excellent environmental protection from moisture and contamination, and Deutsch connectors that qualify for the highest IP67 environmental rating. It has an operating temperature range from -40 to 85 °C (-40 to 185 °F). The flexibility of the ECDR-0506A driver allows for the device to be easily configured for use in specialized applications, such as fan drives and transmission controls. More information on ECDR-0506A can be found HERE. To find out how Scott Industrial can get you great pricing on Hydraforce’s products and systems, please e-mail us at [email protected] or call 937-233-8146. More information on our services can be viewed at www.scottindustrialsystems.com. This entry was posted in Fluid Power, Hydraulics, Industry News and tagged ECDR-0506A, Electrohydraulic Controls, Electronic Valve Driver, Hydraforce. Bookmark the permalink.